You may have noticed, it's Election Day. Voters are turning out in huge numbers, and people across the political spectrum are bracing themselves for potential disappointment. So, we arrive at a new meme built to show how mentally drained and frustrated most people are as the midterm elections land. 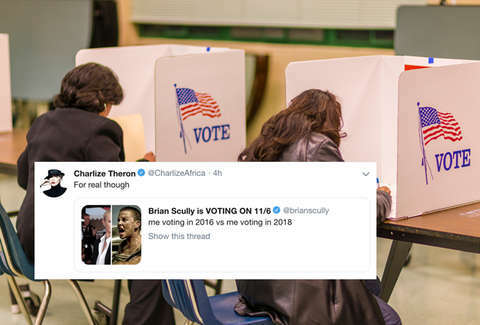 What is the "me voting in 2016 vs. me voting in 2018" meme? The meme is pretty straightforward. (It is a meme, after all.) Post two similar photos on Twitter. The one on the left shows you voting in 2016, and it's meant to convey some kind of innocence or the sense that you were voting in a simpler time whether or not that's true. The image on the right shows you voting in 2018 and conveys that you're voting from a post-apocalyptic wasteland whether that's real or just a mental wasteland. For example, in 2016 you might have been a carefree Con Air Nic Cage with long locks blowing in the wind. Now, you might be the blood-splattered hallucinating revenge monster that Nic Cage was in Mandy. Here are a few of the best versions of the meme on Twitter, which you may find funny or sadly cathartic. The meme is a variation on one that has been around for a long time, according to Know Your Meme. The site says it started as a genuine attempt to show personal growth over time but has devolved into a standing joke about how things are going to hell -- in one way or another -- with whatever topic you're talking about. So, it's not new, even though it feels custom built for the midterm elections.